This is a sponsored post written by me on behalf of BUSH’S Beans. The opinions and text are all mine. There are few cooking techniques I’ve enjoyed lately more than the art of smoking food. Not only does the food come out so flavorful, tender and juicy, I literally get a standing ovation from my neighbors from the wonderful smells that fill our block. Smoking food is one of the oldest forms of cooking, and it was mostly used to preserve meats since back in early centuries of the world there was no refrigeration. Nowadays it’s used to incorporate delicious flavors into meats, salts, cheeses, honestly just about anything you’d like. Smoking food really is a labor of love which is why I can’t wait to eat it every single time I prepare it. While things like pork and beef require an extremely early morning rise time, smoking chickens are much more manageable as they only take in between 3 and 4 hours. You can use whatever kind of smoker you’d like, whether that be a natural wood burning or a digital, it’s completely up to you but it must be done to get all of the wonderful flavors in this white chicken chili. As the weather has begun to turn a little bit, there is no better time to make chili than now. We are in the middle of the football season, the leaves are falling and there is nothing more therapeutic to me on this earth than grazing on a huge pot of chili, especially this white chicken chili. When soup is good then a huge pot is a must, so you’ll have to excuse me for this smoked while chicken chili recipe that could feed your family about 4 to 6 times over. I’m Italian and we love to feed people so whenever I make soup it’s always at least 1 gallon. Like any good chili recipe, it all starts with the beans and to make sure this recipe lived up to my expectations I used 4 different BUSH’S Beans® to guarantee a winning white chicken chili recipe. BUSH’S Beans® has an incredible assortment of beans which made it really easy for me to get to the 4 beans I wanted in this chicken chili recipe. I used a combination of white BUSH’S Cannellini, Great Northern, Pinto and Garbanzo Beans®. 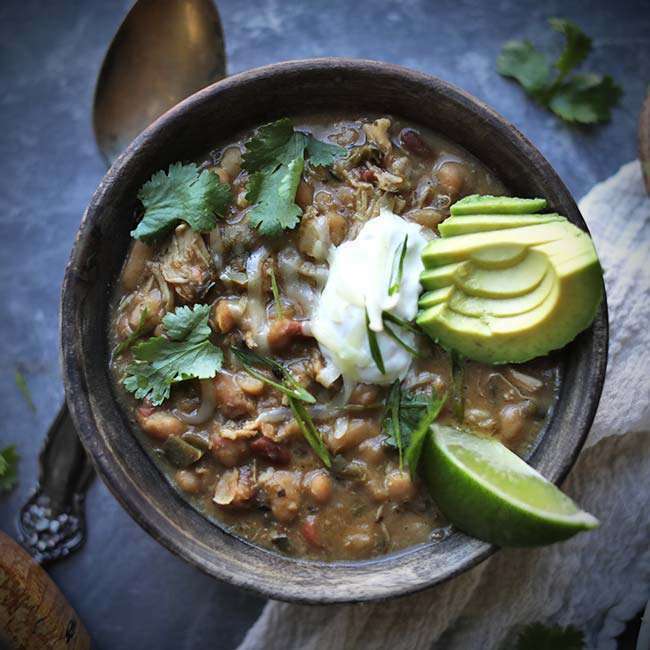 The combo gave such an amazing flavor from the rich taste from the pinto beans to the subtle crunchiness in the garbanzo beans, the marrying of these 4 beans in my white chicken chili was perfection. 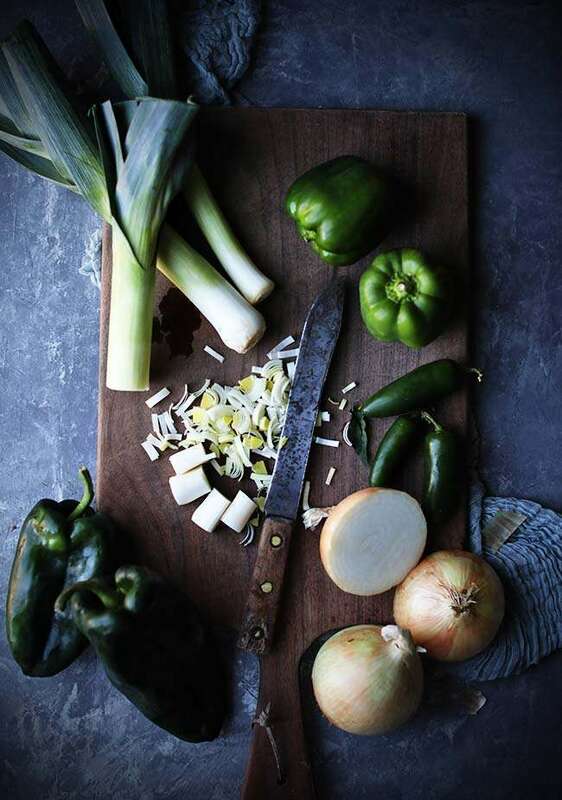 For the base of this white chicken chili recipe I used leeks, onions, green bell peppers, poblano peppers, jalapenos and garlic. Nothing fancy, but a great variety of vegetables to get me started. When it comes to making any chili, I like to take the time to caramelize the onions. It adds such a robust umami flavor with a touch of sweetness that serves as the ultimate starter to this chili. Once the onions are browned and translucent you then want to add in the peppers and sauté for a few minutes before adding in the beans. I used some chicken bone broth as the liquid to help get everything simmering while the chicken takes its time absorbing all those delicious smoky flavors. You can let the vegetables in this chicken chili simmer over low heat during the smoking process so all of the flavors can begin to come out making it absolutely wonderful by the time the smoked chicken goes in it. 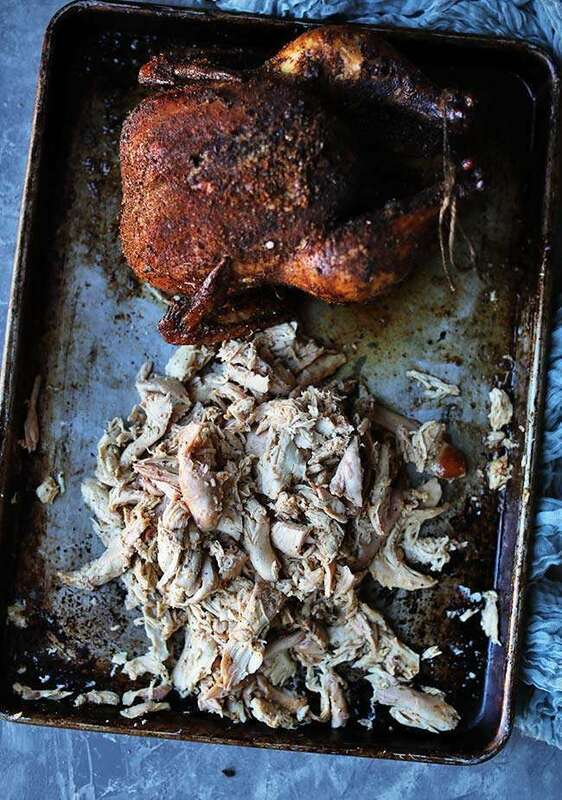 Once the chicken is done smoking you want to wrap it up in foil and let it rest so all the juices can absorb back into the chicken before removing the skin and pulling it. I’m not one for using the skin in chicken chili, but hey you do you if you want to add it just know that the dark red flavors form the smoke and rub may cause your chicken chili to not be so white. I simply used some forks to pull apart the chicken once I removed it from the bones. From there you simply add in the chicken along with some cumin, oregano, Worcestershire sauce, salt and a touch of cream and let that big ol’ pot sit over low heat as long as you’d like or begin pouring some bowls. 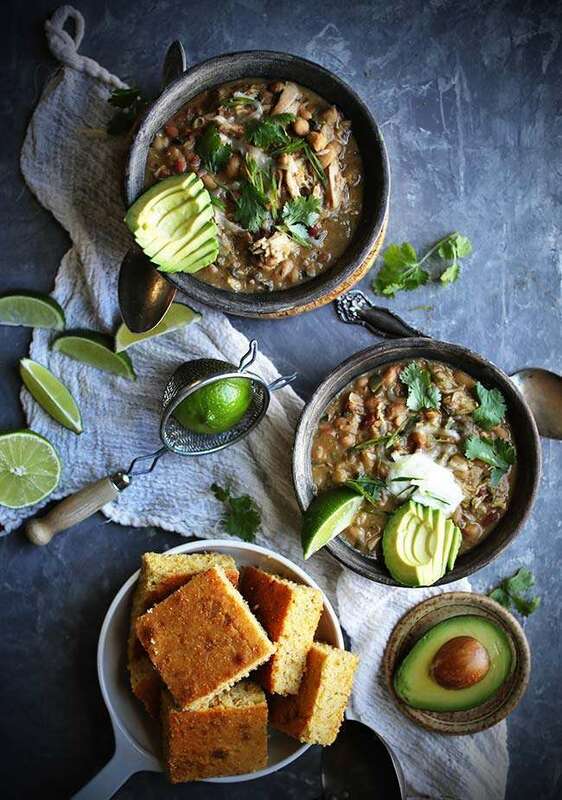 As a rule of thumb, soup or white chicken chili in this instance, ALWAYS tastes better the next day because it gives it time for all the flavors to come out. Break out your smoker and load it up with chips, and make this amazing Hickory Smoked White Chicken Chili Recipe! Preheat the smoker to 225° with hickory or apple chips. Pat the chickens dry on all sides and brush them with canola oil. 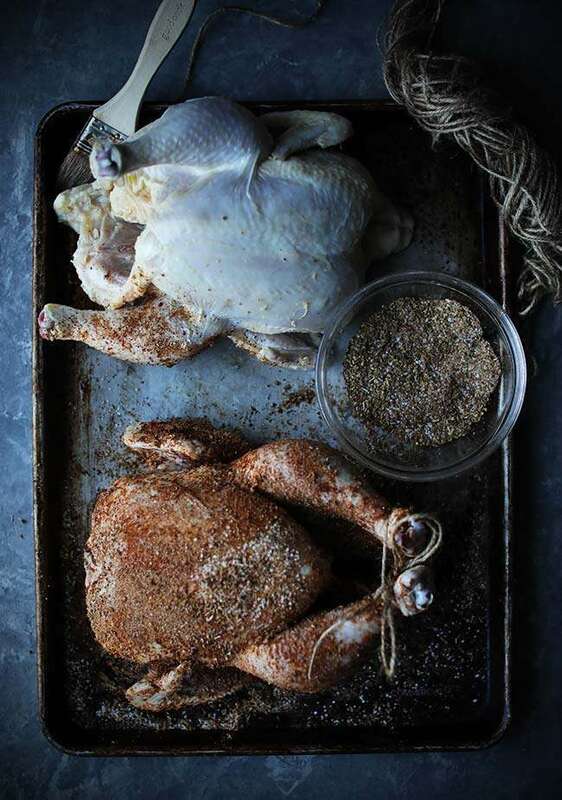 In a small bowl mix together all of the spices and herbs and coat the chickens on all sides, including the inner cavity, and place on your smoker and cook until the thigh portion of the chicken reaches 165°, about 3 to 3 ½ hours. Cover in foil and let rest for 10 to 15 minutes. While the chicken is smoking add butter to a large pot over medium heat and pour in the onions and leeks to caramelize, about 25 minutes. Once they are brown add in the peppers and garlic and sauté over medium heat for 8 to 10 minutes. Next, add in the beans and bone broth and simmer until the chicken is done. Once the chicken is done resting, remove the skin and discard. Next, remove the meat from the bones and break up into bite size pieces. Note: you may only use 1 ½ chickens, depending on how much meat you want in there. Next, add in the spices, cream and seasonings and simmer for 30 minutes before serving. Serve hot with optional garnishes: limes, cilantro, avocado, sour cream, Monterey jack cheese and green onions.